Designed for sporting performance, the new Multifort Chronograph Caliber 60 unites technical innovation and precision. Its sandblasted black PVD-treated steel case houses the Caliber 60, a next-generation automatic chronograph movement that guarantees up to 60 hours of power reserve. Lovers of high-speed sports can count on the tachymeter incorporated into the bezel – a first for the Multifort collection. The black dial, meanwhile, offers perfect readability and is decorated with vertical Geneva stripes that evoke the suspension cables of the Sydney Harbour Bridge. 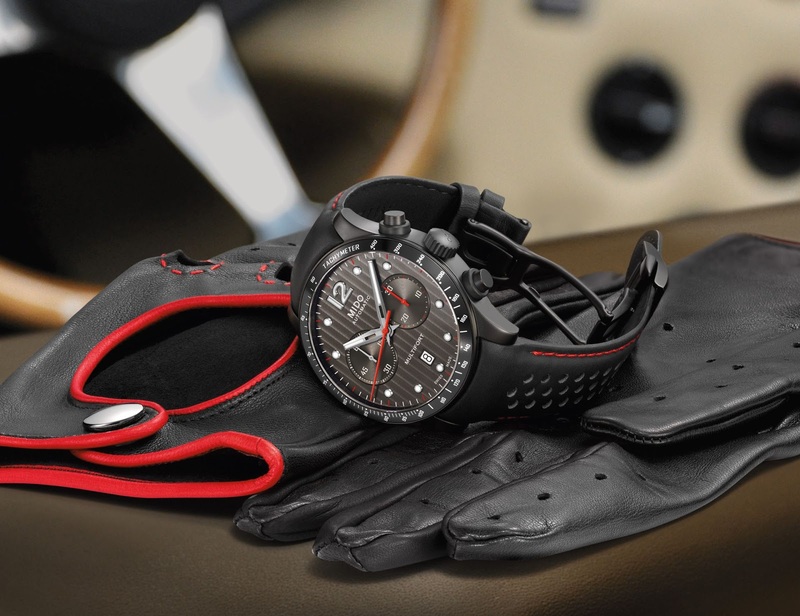 Its remarkable design and black and red colours define the Multifort Chronograph Caliber 60 as a model steeped in character and shaped for motor sports. With its robust yet sporty look, remarkable design and unswerving precision, the new Multifort Chronograph Caliber 60 is a spirited timepiece full of character. It is perfectly suited to all sports lovers, and motor sports enthusiasts in particular. The latter can depend on both the tachymeter incorporated into the bezel – a first in the Multifort collection – and the Caliber 60, an automatic chronograph featuring the latest in watchmaking innovation and guaranteeing up to 60 hours of power reserve. It is enough to win over even the most seasoned sports fans! The Multifort Chronograph Caliber 60 is fitted with a robust 44 mm-diameter case in black PVD-treated steel. Its sandblasted finish complements the matt black bezel perfectly. The central seconds hand and the snailed counter at 3 o’clock are dedicated to the chronograph function, as indicated by the colour red. The snailed counter at 9 o’clock indicates the seconds, while the date appears in an aperture at 6 o’clock. The latter can be easily changed thanks to a quick corrector located on the side of the case at 10 o’clock. The combination of red and black gives the Multifort Chronograph Caliber 60 a resolutely sporty look, which is further reinforced by the black dial decorated with vertical Geneva stripes evoking the suspension cables of the Sydney Harbour Bridge. The touches of white Super-LumiNova® on the indexes and hours and minutes hands guarantee perfect readability, both underwater and at night. Water-resistant up to a pressure of 10 bars (100 m/330 ft), the Multifort Chronograph Caliber 60 is protected by a sapphire crystal treated with anti reflective coating on both sides. It is also equipped with a transparent case back, enabling the wearer to admire its finely decorated automatic chronograph movement, and its oscillating weight adorned with Geneva stripes and the Mido logo. The Multifort Chronograph Caliber 60 comes with a stylish strap in matt black leather with red stitching, which is integrated into the case. It is equipped with a new, highly ergonomic Mido folding clasp featuring two safety pushers that secure its opening. Two other versions of this model are also available. Automatic chronograph Mido Caliber 60 (ETA A05H31 base), 13¼’’’ 30.00 mm, height 7.90 mm, 27 jewels, 28,800 A/H, NIVACHOC A3 shock-absorber, ANACHRON-ETASTABLE balance-spring, NIVAFLEX NM mainspring. Finely decorated TOP movement with blued screws, decorated oscillating weight with Geneva stripes and Mido logo. Adjusted on 5 different positions for a high accuracy. Up to 60 hours of power reserve. Sandblasted stainless steel 316L with black PVD treatment, Ø44 mm, 3 pieces, sapphire crystal with an anti-reflecting treatment on both sides, screwed crown and case back, rapid date corrector at 10 o’clock, transparent case back to see the finely decorated movement, engraved serial number, water-resistant up to a pressure of 10 bar (100 m / 330 ft). Matt black genuine calf leather strap, perforated, red stitching, highly ergonomic Mido folding clasp (stainless steel with black PVD treatment) featuring two safety pushers to secure its opening. Black, vertical Geneva stripes, snailed counters, with white Super-LumiNova®, date at 6 o’clock.